You can advance by check, Dort by Phone, Dort Online, or in person at any of our ten locations. Variable rates based on Prime plus a margin (margin identified at time of application, is defined as the number of percentage points the lender adds to the index rate to determine the annual percentage rate to be charged). To find out more about our Home Equity Loans, call us at 888-837-4317 and ask to speak with a Home Equity Support Specialist. Please read and retain a copy of preliminary disclosures. All terms are subject to change. If terms change (other than the annual percentage rate) and you decide, as a result, not to enter into an agreement with us, you are entitled to a refund of any fees you paid to us or anyone else in connection with your application. Finance charges may be tax deductible (consult your tax advisor). We will take a security interest in your home (collateral). You could lose your home if you do not meet the obligations in your agreement with us. Introductory Annual Percentage Rate (APR) of 1.99% on HELOC begins on date of closing and is effective for 12 months. After the 12-month period, the variable rate APR as disclosed in your Home Equity Line of Credit Account Credit Agreement and Disclosure Statement will apply. Current APRs range from 5.00% to 10.50%. Maximum APR that may apply is 18.00%. Minimum loan amount of $5,000. Closing costs typically include appraisal, title insurance, recording fee and range from $350 to $1,200. These costs are initially waived by the credit union. Repayment of waived costs will be required if the HELOC is closed and cancelled within 24 months of origination. Property insurance required. Monthly payments based on a 20-year amortization with a minimum monthly payment of $50.00. Programs, rates, terms and conditions are subject to change without notice. Introductory APR offered on new Dort Federal HELOCs. 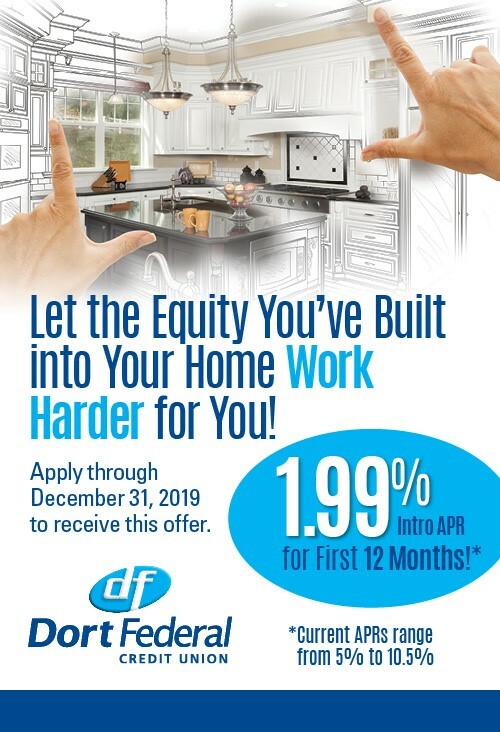 Members who currently have a Home Equity Line of Credit through Dort Federal are not eligible. Offer valid on owner occupied property only where collateral loan to value is 80% or less and excludes all loans already financed at the credit union. Proof of income required, subject to normal underwriting guidelines. Other restrictions may apply. Introductory APR offer good February 1, 2019 through December 31, 2019. Consult your tax advisor about potential tax benefits.